Realgoodwords is a weekly radio program hosted by Heidi Holtan on KAXE – Northern Community Radio in Minnesota, a National Public Radio affiliate. To hear Zippora’s interview click here. 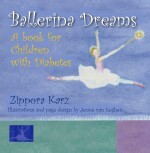 Click on the cover to order Ballerina Dreams from Amazon.com now. Click on the links below to order The Sugarless Plum now. © 2019 Zippora Karz. All Rights Reserved.